For weeks, I have implored Gotham writers to forgo the villain-of-the-week design common among procedurals and comic book shows, in favor of longer, serialized stories that unfold over multiple weeks. Episode 11, “Rogue’s Gallery” was the first instance of the show heading—or at least, appearing to head—in that direction, when deranged convict Jack Gruber escaped Arkham, set to re-appear in the next hour. This small wrinkle had me more excited for a succeeding episode of Gotham than I had ever been before. The truth is, though, that often it’s better for our dreams to stay figments of the imagination, where they can remain unscathed. In all, “What the Little Bird Told Him” was a perfectly competent hour of storytelling, just supremely boring. Again and again the show, to the absolute bewilderment of this reviewer, fails to utilize its comic book heritage, often leaving its episodes devoid of satisfying action or intrigue. What we get instead are stories that are fairly well conceived and delivered, but lack any distinctive flavor. The toast isn’t burnt, or limp, you just forgot to make sure you had any jam in the fridge. The reason this is so frustrating, and was particularly frustrating last night, is because, of all the things a show with comic book roots shouldn’t be, topping that list is dullness. Comics are a genre well wrought and beautifully drawn, but often, gloriously, insane. 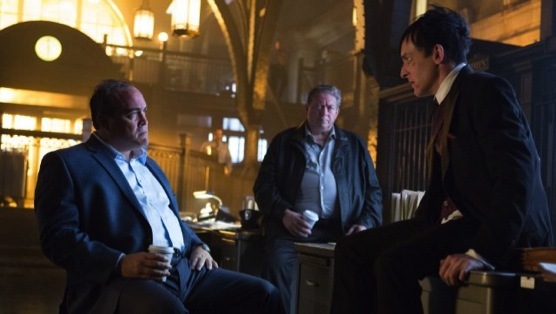 I understand that Gotham is, essentially, a prequel show and thus much of the eccentric characters that fill out Batman’s portfolio do not yet exist, but no show with the creative freedom provided by a comic book world should be delivering episodes week after week that leave viewers on the edge of sleep. Episode 12 had every opportunity to remedy this situation. At the center of the hour was a man bent on revenge against Sal Maroni, who uses the manipulation of electricity to both attack and control people. It’s just the kind of character a show like Gotham should thrive with. Instead, it squandered the opportunity and gave viewers another hour that decidedly lacked in punch. The good news is that this week’s storyline, like those of the past few weeks, was tight from beginning to end. The trend of meandering hours that bounce from character to character with no semblance of flow seems to have, thankfully, gone by the wayside, though I wouldn’t declare it dead just yet. Carrying Jack Gruber (whose real name is Lester Buchinsky, and who becomes known as the Electrocutioner) over two episodes did deliver one positive: allowing the writers to focus sharply on his story. The downside was that the storyline, while showing promise throughout much of the hour, came to a conclusion that was at best, silly and at worst, a complete let down. One of my earliest, and biggest, gripes with Gotham was its inability to seal the deal. So often the show has put in the work to build a decently entertaining story only to lose control of the situation in the final act, and this episode was no different. While it was easier to overlook this lack of execution early on, and still is to a point, given that the show is only a dozen episodes old, it is indisputably discouraging. Gotham so desperately wants its audience to believe in the long game, to believe that something is always lurking around the corner that could shake up the entire ecosystem of the show. But, it’s impossible for a viewer to do that when the show consistently wastes ample opportunities. The B-side of “What the Little Bird Told Him” involved the ongoing struggle for power among Gotham’s mob figureheads, and once again it failed to raise blood pressure in any significant way. Everything about the mob storyline bores, because it feels predictable, which is a truly bad place for a show like Gotham to be. This series carries itself with an air of unpredictability, constantly teasing tidbits of what’s to come with ads and behind-the-scenes features, when what is to come actually feels very clear. The writers would be wise to change this perception quickly, as right now the show sits at the beginning of what could be a very long, and very tedious rut, until the season’s final episodes come and (hopefully) liven things up a bit. ?While I can’t say that Gotham is anywhere near being must-see TV, I can say that the pieces are coming together. Over the first dozen episodes, the show has slowly but surely progressed in terms of writing, acting, plotting, etc. Rough edges still exist, and rear their heads often (such as Edward Nygma’s puzzling presence in this episode), but most of the elements have improved to, at least, be considered serviceable. What’s needed now is a simple dash of excitement. Perhaps I am in the minority in this thinking, but it’s hard for me to believe that most of Gotham’s viewers find its current storylines thrilling, or even worthwhile. More often than not, instead of wondering what happens next, I find myself checking the clock, wondering when it will end.